Set in the 60's, a time when a social revolution was beginning to change the mind sets of society, comes a feel good story about an inspirational teacher, Mr Simon (Ed Harris - The Truman Show, Apollo 13, Nixon, The Way Back) who instils in his pupils, a new way of thinking that will change their lives forever. One kid, whose outlook on life takes on a whole new meaning, is 12 year old Andy Nichol (Chase Ellison - Tooth Fairy, The Year of Getting to Know Us, Fireflies in the Garden). A bright student, Andy is put to the test when his English teacher Mr. Simon pairs him up on a project with the school's biggest outcast, Stanley, also affectionately known as Big G because of his large frame, facial features and ginger hair. After seeing Stanley fearlessly confront the school bully, a series of events are triggered that will alter the lives of both young men forever. Not only does Andy begin to learn that being different is acceptable, he also learns the value of tolerance. 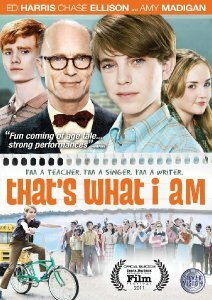 That's What I Am released on DVD and Blu-Ray from 11th July, and will be available at all good retailers and online at www.silvervision.co.uk. Clear Vision Ltd is one of the UK's leading home entertainment publishing companies with an extensive international distribution network covering Europe, the Middle East and South Africa. Operating for over 20 years, Clear Vision is the exclusive DVD licensee for World Wrestling Entertainment (WWE), Ultimate Fighting Championship (UFC), National Basketball Association (NBA), Gaiam, Marvel's classic animated TV series and a number of other titles. Via its labels Clear Vision, Silver Vision and FightDVD, the company sells both direct to consumers and through a variety of retail outlets. For further information on Clear Vision visit www.clearvision.co.uk. The Silver Vision label is wholly owned by Clear Vision Ltd, the official licensee for World Wrestling Entertainment (WWE) DVDs in the UK, Europe and Middle East. The company has held the official WWE video/DVD license since 1989 and is their longest serving licensee. Silver Vision releases over 35 DVD titles per annum including all WWE Pay Per View, personality and major event titles such as WrestleMania and Royal Rumble. For further information on Silver Vision visit www.silvervision.co.uk.